While the main course meal is good and all, one of my favorite things about the holidays is sitting in the kitchen, munching on the appetizers while dinner is still in the oven. The kitchen really is the heart of the home, where everyone comes together to graze on the goodies and pass around love and laughter. Some of my family good-heartedly complain about 'too many butts in the kitchen' while dinner is still heating through, but even with the tight squeeze, it's nice to have a room filled with love. I usually have a cheese and cracker tray set out before dinner, but this year I am trying for a more classy approach to the meal (did you check out those adorable cranberry acorn squash from last week?) 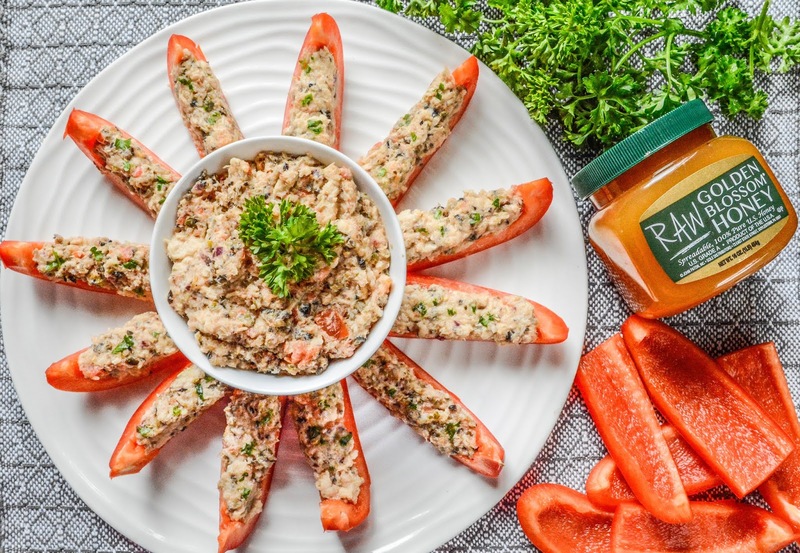 and thought it would also be fun to set out these Tuna and Red Pepper Appetizers from Golden Blossom Honey. These appetizers are not only great for Thanksgiving, but I think with the red and green, they would be really festive for Christmas too. Since it's a no-bake recipe, it frees up the oven for other dishes. All you need is a food processor and a knife and you can have these peppers stuffed and on the table fairly quickly. You could even halve baby peppers and stuff them with the filling for a fun football snack as well. What's your favorite holiday appetizer? Looks like it will do the trick for those waiting around. haha if we all converged in the kitchen while things were cooking, we'd get kicked out. such a tres chic arrangement you made! Look lovely and refreshing and almost springy! I don't do peppers any more as they give me bloating for some reason, but I do sometimes miss the sweet red ones which we use for making paprika. I agree about us liking the appetizers more. Maybe because meat isn't the main focus on them. I love me some red peppers and would hate to have to give them up. Allison always asks me to buy her red peppers for snacking on. Jason doesn't love any kind of pepper, but will eat them if I put them on his plate. He wouldn't be happy if I made something like tomato stuffed peppers for dinner, but if I saute them or grill them, he's fine with that. Maybe you should try to stuff them with potatoes and bake them for him, that is the only way I eat them myself sometimes :) I just stuff the long, red, sweet ones (not the bell types) with some grated potatoes mixed with an egg, diced onions, vegeta, maybe some veggie cheese and a bit of oil and then bake them in the oven. If you cut the peppers horizontally and make boats the potatoes will be roastier, if you cut just the top they will be more like boiled potatoes. My mom loves dicing and stir frying peppers with onions and then adding rice into it and come water and tomato juice or puree and cooking it until rice is done, but I hate it with passion :) We call that 'dyuvetch' in my country. We also eat tones of dry roasted peppers which you then peel, and use as a salad with some oil, garlic, salt and vinegar. It's not how it's made that's the problem, he says that peppers make him burp and then he can taste them all day long. He didn't mind them in the O'Brian potatoes that I pictured here the other day because there was only a small amount in there. I guess you and him both have a bloating or indigestion issue when it comes to peppers. yes, peppers, cucumbers and cabbage sort of veggies are among top hard to digest things for most people beside dairy products. Burping thing goes for fried onions too for most people. I had a HUGE get together with aunt's, uncle's, cousins, cousin's kids, well you get the picture. They want to stop so many get togethers. We're just doing one by Thanksgiving. Then one in the spring. New traditions have to be made. We're going to my sister's for Thanksgiving. We're all bringing small snack things this year. This would be good to take. We've cut down on family gatherings in recent years too. As families expand, it's really hard to keep squeezing everyone into one house. We still do the major holidays though, Easter, Thankasgiving, Halloween, Christmas, and maybe a gathering in summertime if someone randomly decides to host a party. It's sad when you have to start cutting down, but necessary when one person is doing all of the hosting or work for everyone else. That's really interesting and something that I would eat. I try to eat lower carb but during the holidays it's hard. My favorite appetizer is crab stuffed mushrooms. Those look so good! I love the color and presentation, and I love how healthy it is. It doesn't get much better! Those are great little appetizers. They are so pretty, which is one of the things you need for a good appetizer. They sound really tasty, too. Wow! What an awesome appetizer! These look perfect for Christmas/New Years. Being a fan of tuna, this is right up my alley. I love the addition of red peppers. You sure know how to turn food into art. 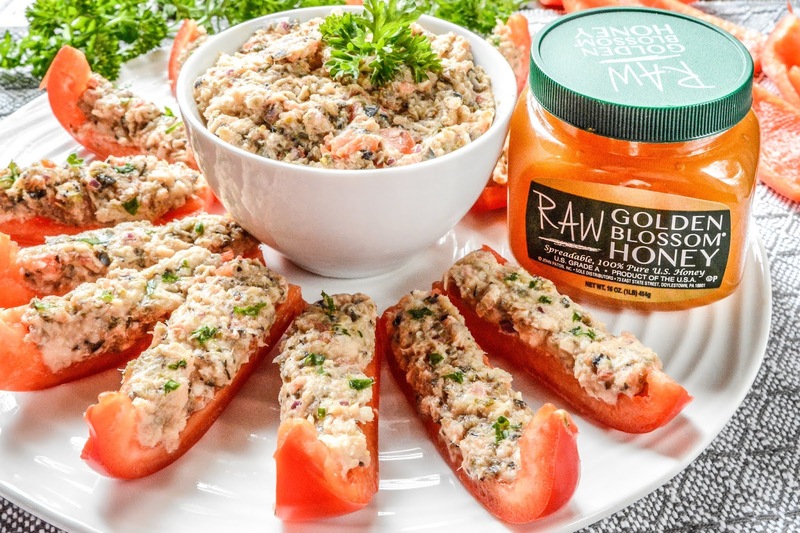 What a fun way to use tuna. That's one thing we don't use all that often, but my kids all like it! I love this, Theresa! I can eat them all..I usually put my tuna mix on top of cruncy sourdough but pepper is great! It looks very easy and fun to do! I love bellpeppers and we have tons of it at home. I’m excited to do my own version and will let you know. This looks like a Delicious app! I would love to recreate this one day no idea honey was in it!